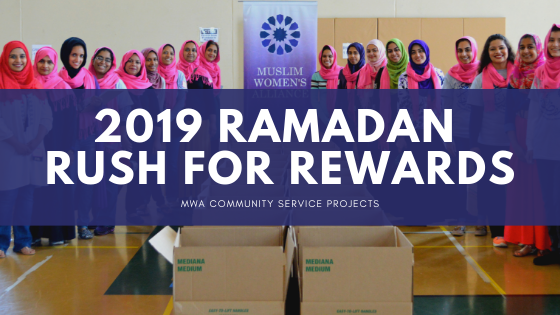 This Ramadan, be a part of Muslim Women’s Alliance annual community service projects: Ramadan Rush for Rewards (RRR). Join hundreds of dedicated volunteers of all ages caring for people of all faiths and backgrounds. Start off your Ramadan by supporting your Muslim neighbor in need. This Ramadan, Muslim Women’s Alliance volunteers will once again be packing food and supplies for 500 local Muslim families. Each family in need will receive a box with essential food staples, cooking supplies and grocery vouchers for the entire month of Ramadan. Please donate your time and financial support for this family. This program is certified to accept zakat-eligible and tax deductible donations. WHEN: Saturday, May 4th, 2019 at 10AM – 2PM. Click bit.ly/Serve4MWA to donate now! Head into the last ten days of Ramadan with a community service activity for the whole family. On Saturday, May 18th, join Muslim Women’s Alliance volunteers to make blankets, assemble ChemoCare kits, pack meals for local food pantries and collect for Refugee Eid Gift Drive. Our annual “Comfort, Care & Collect” service project is about gathering volunteers together to make and immense impact in the community on multiple levels. We are #StrongerTogether. Please donate generously. 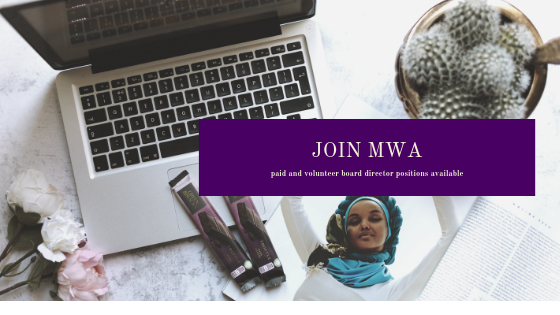 MWA thrives on your donations to fund the many community service and philanthropic events that would not be possible without your donations. JazakAllah Khair in advance!